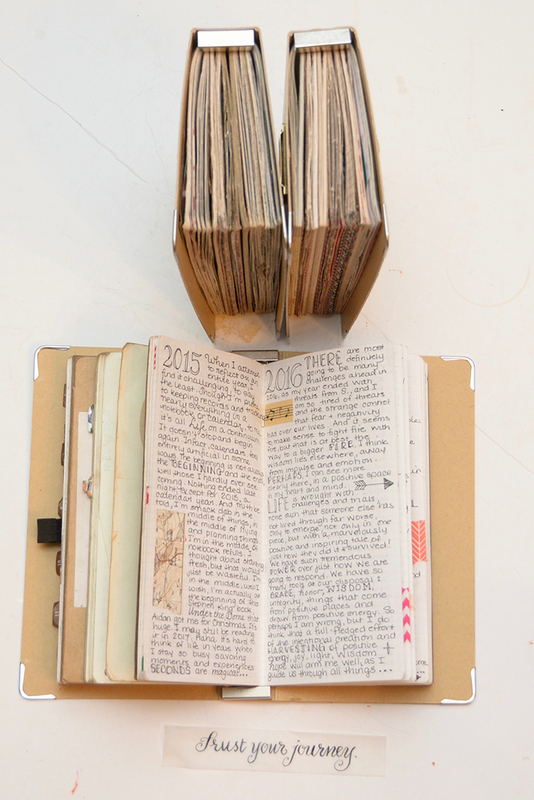 I’ve kept a notebook of one kind or another since I was a young girl of around nine years old. My first was a black marbled composition book, like the kind you could pick up in the stationery aisle of most supermarkets. Nothing fancy. Later I’d discover that Jean-Michel Basquiat used the same kind of notebooks, and he was genius, brilliant albeit haunted by ghosts. Mine will not end up in art museums like his, but they served their purpose and housed a few ghosts as well. Over the years, my notebooks have served all sorts of purposes. They have been repositories for my creative writing and poetry. They have been organizers. They have been places where I plan and dream and celebrate the magic of life. Ah, there is so much magic! They have been places where I process my thoughts and come to better understand the world around me. And in times of deep sorrow, they have been places where I’ve grieved. On the organizational side, they are extensions of my brain. On the personal writing side, they are keepers of my heart and soul. I don’t find them to be particularly artistic, but more about maintaining order in my life and making sense of the world around me. Yet, there is a certain artistry to examining and observing life. Perhaps, that is art. To help me stay organized in my daily life. To give me a place for planning and dreaming big. To provide with a place to remember. To provide me with a safe place to process my feelings and grapple with things big and small, not so serious and serious. I carry two everyday notebooks. My everyday notebook is a brown, regular sized Midori Traveler’s Airport Edition, which a friend purchased for me while he was visiting Japan. Inside of my notebook, I currently keep just two inserts and a few accessories. 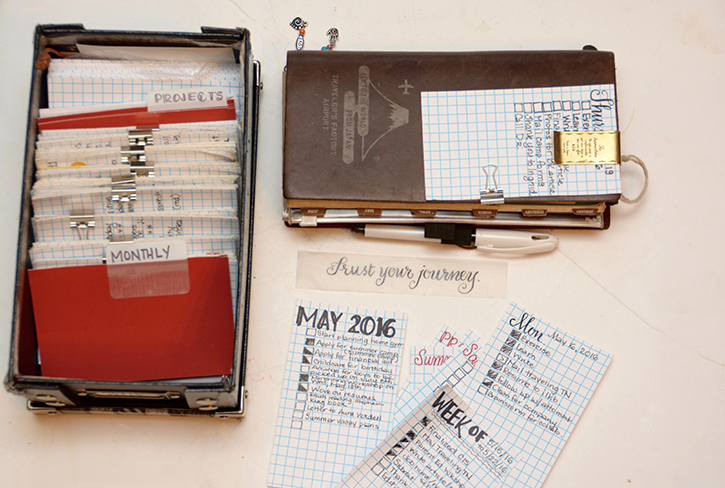 The first is the weekly diary with grid memo and the other is a grid-ruled notebook. My calendar primarily helps me track my daily schedule. I write down mostly everything because it really helps me remember what I have to do. These days, I use the memo side of my calendar to keep my gratitude. I try to record something or several things for which I am grateful each day. Going through the process of being grateful every day really helps to keep life in perspective. No matter how tough a day has been, this practice really helps me remain positive and grounded. I think being grateful plays a lead to having a more positive disposition. I also use a plastic zippered pouch and folders to hold important items and papers. One folder is a Midori kraft file and the other I crafted myself. I’m quite excited about that one. I’ve added two pen holders that adhere to my kraft file. They hold my two favorite pens. I go nowhere without my pens. Daily notes that I take throughout the day are written in my second insert, which is a grid-ruled notebook. 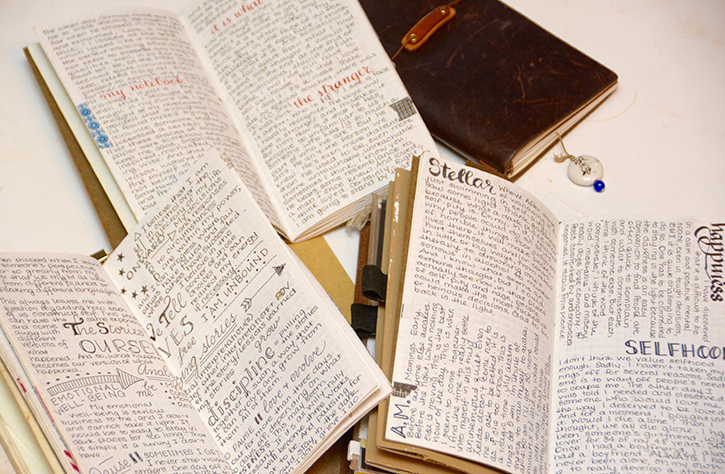 I also do my personal writing in that same notebook. Everything is kept together and I use nothing to distinguish one type of entry from another. For me, that works. Rather than compartmentalizing everything, it’s actually simpler for me to keep it all together. That may not work for everyone and that’s an important thing that I’ve learned. 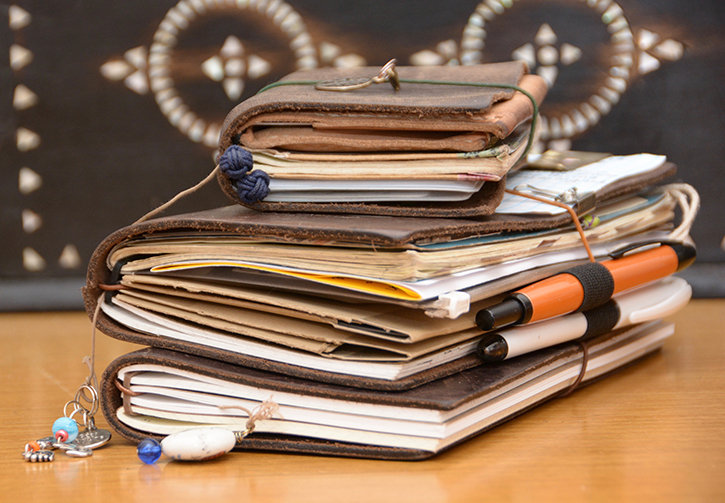 There is no right way to keep a notebook. Inspiration from others is great. Take what works for you and leave the rest. I love looking at other people’s systems, even if they would never work for me at all or in their entirety. It’s amazing how different and unique they all are and we all are. As for personal writing, I process a lot of my thinking on all types of matter through writing. Over the years, I’ve learned various types of writing styles and modes that help me explore my ideas and thoughts in writing in many different kinds of ways. My training as an English teacher and writing professor has certainly influenced how I write in my notebook. I truly believe that exploring our ideas and our thinking allows us to know ourselves and our thoughts better than anything else because we can really capture them, tame them and lay them down, so we can organize them, see them, and really examine them reflectively in a way that nothing else really allows us to. It has been my greatest life tool and from it I’ve have learned my greatest lessons. On the front of my notebook is one of the most important life management tools I use. It’s a simple grid-ruled, 3 x 5 index card, on which I keep my daily task list. I call them “action cards.” Over the years, my action card system has evolved. It now consists of a set of index cards. I have a monthly card with a list of what I plan or hope to accomplish in that month. From my monthly cards, I create my weekly action cards. My daily task lists are then drawn from my weekly list and then whatever else gets added in the course of just living life. This has probably been the most effective system for keeping me organized and productive. My current daily action card stays out, clipped to the outside cover of my notebook with a Superior Label brass clip, it serves as a visible reminder of the things I need to do. I check it frequently throughout the day. Those days that I’ve neglected to check it are the days when I don’t accomplish the things I’d set out to accomplish. The lists really do keep me on track. I think we all feel more positive when we accomplish things that we actually need to and set out to accomplish. I also carry a Hong Kong Tramway passport size Midori notebook, which I use as a wallet. It has a leather zipper pouch in it that holds my debit card, credit cards, and money and a plastic card sleeve for other cards. The kraft file holds receipts from the day and a blank insert allows me to track my daily spending in a simple way. When I spend money, I simply write down the amount and what the item or service was. Just tracking my spending, actually helps me curb and control my spending. I believe that a well-examined life is a happier life. There’s much research out there that supports the idea that personal writing can lead to greater happiness. The benefits are real. The analogue tools and systems that I use are part of a lifestyle that I choose. One that I believe leads to well being and positive living. Write the kind of life that you’d feel inspired to read. I love this post. 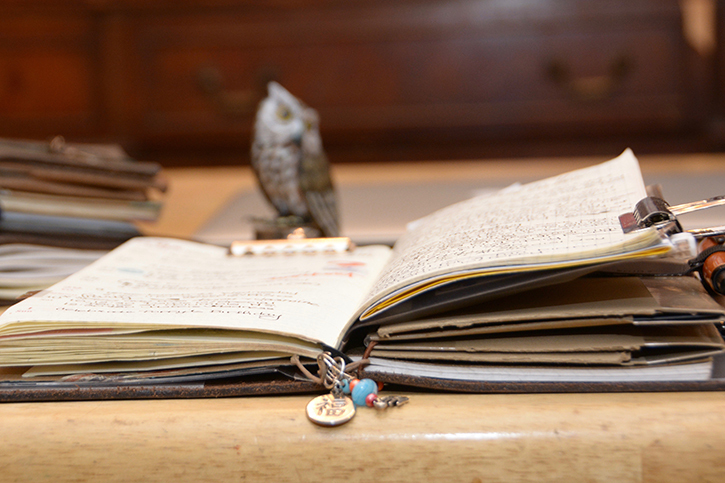 I read it with my mother and she fell in love with the Traveler’s Notebook and is now deciding on which one she will order. 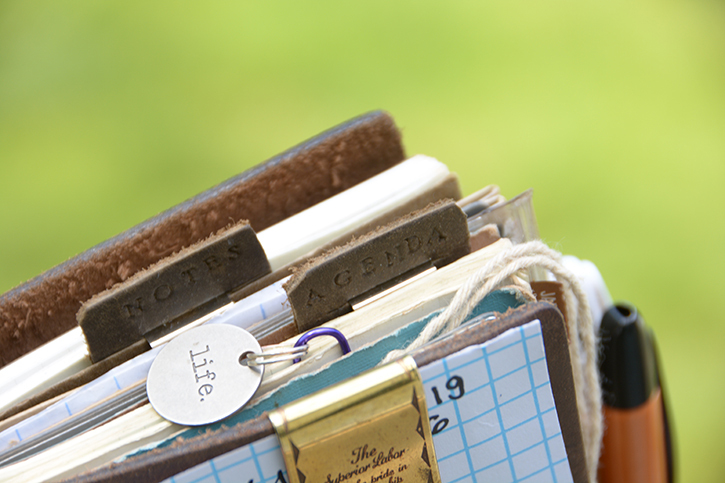 She especially loved the ball charms on your planners ( blue and auburn) in the photos. Could you tell me where you got those? I’d love to surprise her with them for her birthday. Beautiful post, I’ve enjoyed everything you’ve written!!! The simplicity is key…. 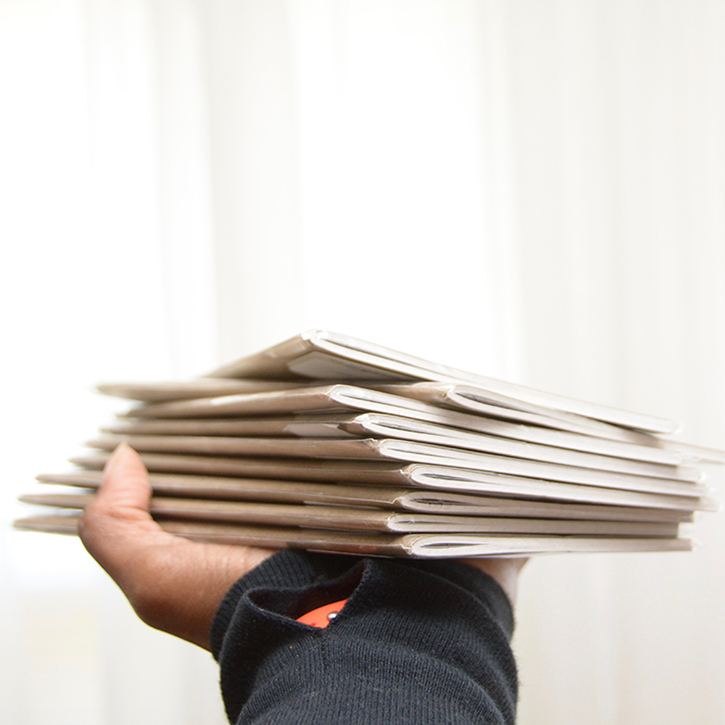 the monthly, weekly, daily cards are a great way to accomplish and organize. Great idea! I love your approach to keeping a journal and I share your beliefs :) thank you for this post, you’re a huge inspiration for me. 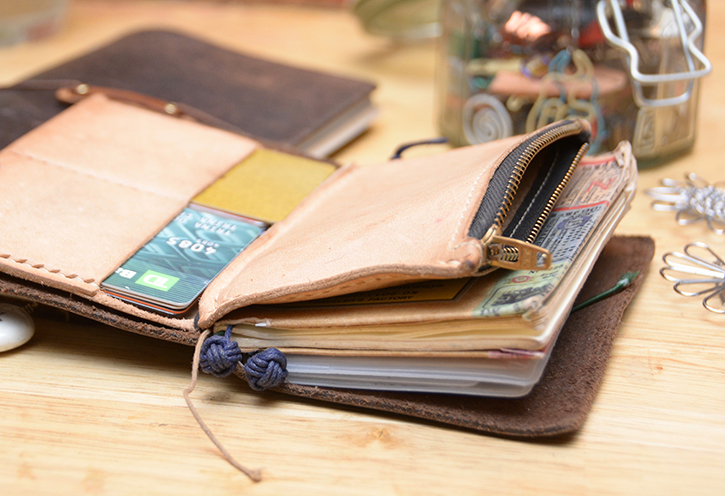 Love the idea of using the TN Passport as a wallet — and tracking spending that way! Trina is a rocker journalist and it’s great to see her getting amazing exposure. Learn so much from you, just looking at your posts in Instagram. Especially how you organize a two page spread, by writing in different angles. 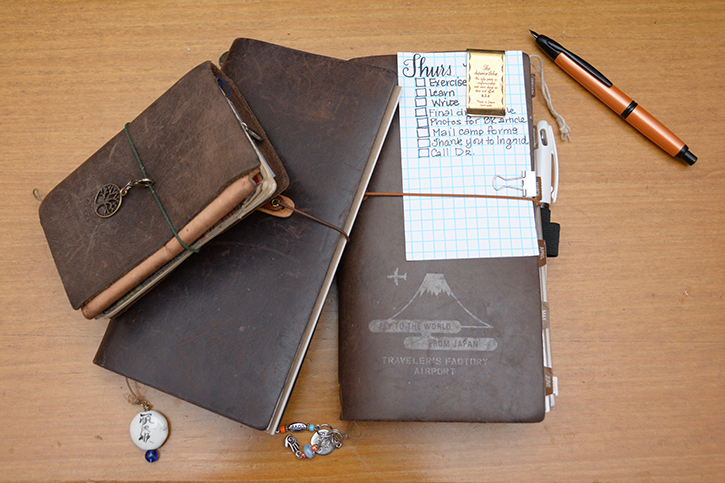 Thanks for sharing with us your Midori notebooks. Very nice post. I enjoyed reading it. I too enjoy seeing how other people use their TNs. I like the sentiment of taking what works and leave the rest. We are all individual so it is important that our notebooks reflect our lives. 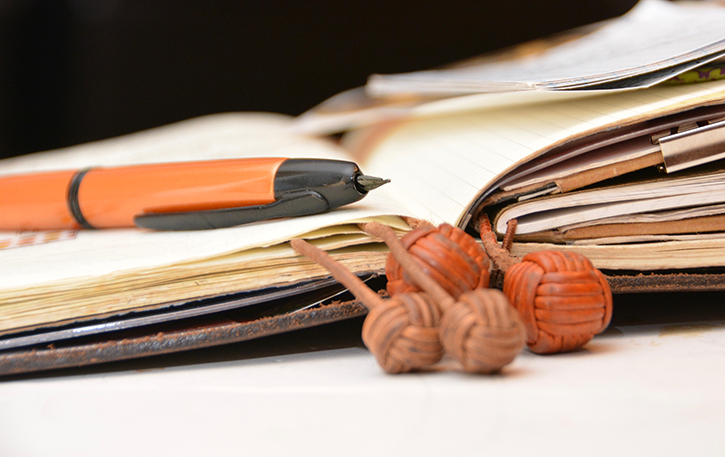 I don’t know what I would do if I couldn’t unload in my journal :) I would like to know where she found the leather tabs pictured above (agenda and notes).